So you have this file and you don't know how to open it. The person who sent it to you doesn't seem to know either, and your deadline is ticking nearer. What do you do? Head to Go2Convert.com. Go2Convert is a handy little site that's not much to look at but serves an incredibly useful function. Upload any file in practically any format, and it'll let you convert it into something you can use. The site handles more than 100 different formats, including weird ones like PostScript, PhotoCD, EXR, and DPX. Once you've selected a file from your hard drive and uploaded it, the site will identify the file format and present you with a dropdown menu of compatible formats that you can save the file in. 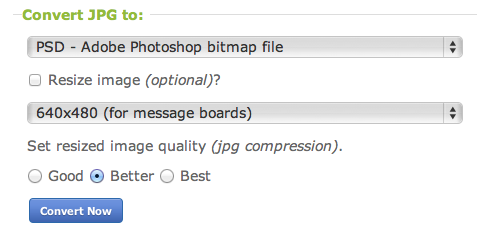 Choose one, select a file quality (if applicable), and then click Convert Now. Once the conversion is done (it usually takes only a few seconds), the output file will appear below the input area of the screen. Click Download to save it to your PC.